When I try to embelish text (color, font, resize, etc.) in the Free Text (HTML) section the text vanishes not allowing any changes. When I hit complete the text comes back unchanged. Please try logging out Jotform, clear your browser's caches and cookies, then log back in Jotform and try one more time. 1. Click on the Icon that seems a person. 3. After that, click on Settings option from the left side menu. 4. Then click on Clear Cache. I have tried all of your suggestions but still cannot edit the text from its original input. I have cleared browser caches and cookies as well form caches. Any other suggestions? 1. 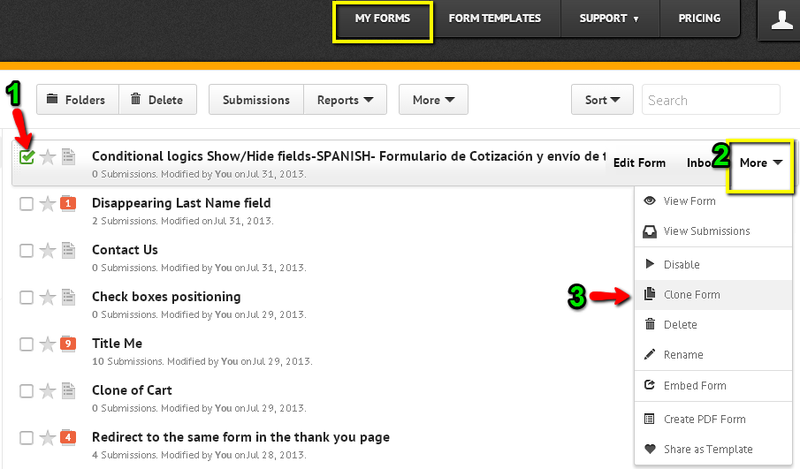 While in MY FORMS page select the form. 2. Then click on More option. 3. There choose Clone Form. Your form will be cloned automatically and you will be redirected to the form builder, there try to edit the text of the field. Please let us know if this works or if you need further assistance.